Alfred Nobel and his will. 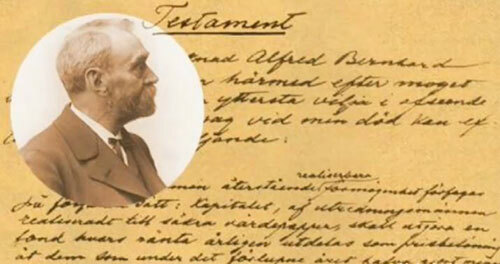 Alfred Nobel’s interest in science, culture and society is evident in his will. In the third and last will that he signed in Paris on 27 November 1895, he declared that the major portion of his fortune should go toward prizes in physics, chemistry, physiology or medicine, literature and peace. Not everybody was pleased with this – it took four years for the executors to convince all parties to follow Alfred Nobel’s wishes. On 10 December 1901 the first Nobel Prizes were awarded. The first Nobel Prize Award Ceremony was held in 1901. The names of the Nobel Laureates had been kept secret and were revealed only on the same day. Experience the very first ceremony through this eyewitness report. In 1895, scientists and the public were stunned by chilling images, showing the inside of a human hand. The images were created by a mysterious and invisible type of ray, discovered by Wilhelm Conrad Röntgen, who later received the first Nobel Prize in Physics 1901. And what makes the sap of the oak tree rise? Jacobus H. van ‘t Hoff, the first Nobel Laureate in Chemistry, explains osmotic pressure and its importance in plant and animal life in his Nobel Lecture. Diphtheria took thousands of lives before a cure was found. In 1901, Emil von Behring was awarded the first Nobel Prize in Physiology or Medicine for his work on serum therapy, especially its application against diphtheria, “by which he has opened a new road in the domain of medical science and thereby placed in the hands of the physician a victorious weapon against illness and deaths”. An eye disease forced Sully Prudhomme to discontinue his engineering studies and direct his life into literature and poetry writing instead. His works showed a “rare combination of the qualities of both heart and intellect”, and earned him the first Literature Prize. Henry Dunant, founder of the International Committee of the Red Cross, shared the first Nobel Peace Prize with Frédéric Passy, a leading international pacifist of the time. Since then, the Red Cross has been awarded the Peace Prize three times.